Sun In Bloom is, hands down, one of my all-time favorite restaurants, has agreed to share her story with us. She is a friend, mentor, inspiration! I send my clients to her for juice cleanses, go for meals as often as possible, and use her as a reminder that I can make of this life whatever I out my mind to. 1. How did you first get involved in the world of health and wellness? My interest in health and wellness goes way back... I cannot remember a time in my life when I didn't have this interest. However, there was a time in my life (teenage & early adult years) when I was very depressed and lonely while "trapped" in an abusive relationship that led to many years of self-sabatoge and a willingness to compromise my health and wellness. After years of self inflicted abuse and pain, I had an epiphany that I was not living a life of truth and after this wake up call, I did a 180 and dedicated myself to a journey of healing, self-discovery, and becoming my best self. I know this sounds so cliche, but my life really changed with the flip of a switch on my 28th birthday. 2. Was it always a dream of yours to own a restaurant or was this something that manifested itself out of your love for health and transformation? I do not recall ever having a solid dream of owning a restaurant. However, I've always had a dream to create a space for gathering, knowledge, and love. And I've definitely always had a very strong passion for food. I just never thought I had special talent in the kitchen or imagined I'd ever have the resources to open a restaurant. So , yes! Sun In Bloom most definitely manifested out of my love for health and transformation. I've always felt as though I am just channel for Sun In Bloom. 3. I remember when you first opened Sun In Bloom in Park Slope and we were psyched to have a health food restaurant serving the types of foods we most love to eat at home. Since then you've expanded tremendously! How is it different now from then and what are your favorite parts of running such a bustling establishment? Gosh... I'm finding it hard to answer this question. I decided to open Sun In Bloom after I returned from a very healing journey I was on in Europe. After I said Yes to Sun In Bloom, I opened the business just 2 weeks later. On one hand it's really great I just took action and jumped off my cliff of fear because if I had ever picked up a book about "How to open a restaurant", I would not have had the courage to do what I did. Honestly, I did not know anything about running a restaurant and immediately after opening, I was paralyzed with fear. I spent my first year in the flight or fight response. So because I was operating from this place of acute stress, my first year feels like a black hole. Today I am in a completely different place and feel that for the most part Sun In Bloom is truly a reflection of my original vision. I do not think I can even begin to compare the Sun In Bloom today to what it was when I first opened. My very favorite part of running Sun In Bloom is being part of a creative collaborative business and being of service. Sharing my passion energizes me. I love bringing community together. I love creating jobs. And I love being a witness to others discovering the powerful relationship food has to our experience in this world. 4. People from all around the world seek out your amazing food and juices, how does it make you feel to know you're touching so many hearts and stomachs on a daily basis? This inspires me to go to work every day. It makes me feel aligned with my purpose and I cannot imagine living my life without purpose. 5. Though i'm no celeb stalker, i've seen a handful of supercool famous faces in SIB (Maggie Gyllenhaal…whom I love love, and Usher to name a couple). Has that helped drive business? Do they attract extra attention? Or are they like any other customers and just needing their SIB fix like the rest of us? We do see celebs on a regular basis. However, I'm not sure this has had significant impact to growing our business. I have not had the courage to ask for their testimonial and just love to see every guest that chooses to walk into Sun In Bloom as a celebrity. 6. What is your favorite part of running SIB? Your least favorite? And if you could do it all over again, would you do it the same? My favorite part is fulfilling my purpose and for the opportunity to make a difference in people's lives. I am truly grateful for this. My least favorite part is that I struggle with feeling that I've sacrificed a lot to be the chef / owner of a restaurant. I often feel lonely in this role and find myself struggling with my faith that I will have time for myself or relationships outside of my business. My latest fear is that I will forever be alone! But, I do not deep within every fiber of my body that we create our destiny and have the upper hand in writing our story. I just embarked on a 30 day juice cleanse to realign with my faith. It's hard to say whether I'd do it again the same. I was to say No... absolutely not. But, then again, the stars aligned and I was presented with an opportunity to open Sun In Bloom. If I had not jumped, I do not feel confident we'd have Sun In Bloom today. So, no regrets. I live a very charmed life and feel grateful every day for my journey. It's definitely been an adventure! 7. And lastly, what is your favorite menu item for breakfast? Lunch? Dinner? Oh goodness Eve... I love everything I've created for Sun In Bloom's menu! But, my all time favorites include our Granola Delight, Chia Seed Porridge, Bella Divine Kale Salad, Bloom Burger wrapped in a collard green and Shitake Mushroom BLT with avocado. My gorgeous friend Shachar just had her twin babies last weekend and I'm totally in love. They are edible and she's already a superb mama. It was a real struggle for her (as it is for so many of us) and I wanted to take a second to honor her and her journey. Just a week or so ago I went to visit her while she waited for those babies to arrive. We chatted adventures in baby waiting (no fun! ), ate some tacos (she and her husband are owners of The Taco Truck...I wrote about them here...you have to go try, it's UH-mazing, and they have a shop now too in Hoboken), and waited. And now they're here! I can't wait to mush and spoil them. PS- don't forget to got for me in the Circle of Moms Top 25 Vegan and Vegetarian Bloggers here. Last night we went out to dinner here in Florida with our friends Casey and Michael to a vegan restaurant called Darbster. We always have the best time with them and literally talk all the way through the parking lot until we get into our separate cars are are forced to stop! Last time we were in town I found Darbster on the internet and suggested we try it. We all loved it so much we decided to go back and totally loved it even more this time. It's totally vegan with an amazing menu that spans from fried "chicken" to a handful of living foods (raw) options. Plus there was a guy with his guitar playing Beatles and other groovy music. It was totally perfect and delicious and I have a feeling we'll be back again. And...after our last dinner, Michael decided to dip his toes in the pool of veganism! Since he's dabbled back and forth a bit into his old carnivorous ways, but he's interested and intrigued and totally experimenting in a non-meat diet and I totally love it! This past Saturday we decided to head out east for some fresh air and a relaxing couple days. We left in the afternoon with Richie's brother, Bobbie, and his girlfriend Andi (who I love love). The car ride out wasn't too bad and we made it out just before dark. We ran out quickly to get some groceries and spent the night in with a fire blazing, vegging on the couch. It was pretty perfect. The next day I woke up craving Babette's for breakfast and already had my mind set on Provisions for lunch. Unfortunately Babette's was on vacation, which only fueled my craving for lunch! Provisions has been around for a long time (I think), but we just recently found it and it's totally rocked our beach time world! If any of you are ever out on the east end of Long Island, you must must MUST try it. It's a health food store with a cafe in the back and they are both totally fabulous! We always hit it up on our way home for groceries and food fuel for the ride. The east/west wrap literally makes my mouth water. Ok now I want one, ha! They also make vegan thumbprint cookies to die for (we brought home eight!). Hi everyone! Sorry about the no post yesterday. We had a crazy day of running around, having fun, shopping, visiting with my sister and mom, vegan lunch on the Upper West Side, and we finished up our day with a photo shoot for the New York Times (I'll tell you all about it when the the article hits the stands, it's all about families living in Williamsburg)! Avi and I started our day hitting up our first ballet/tap class for which we were both in jeans when everyone else was wearing cutie patootie ballet gear. Nonetheless, Avi loved it and continued to "more dance" me all day long. After class and a little play time at Klub 4 Kidz Richie scooped us in the car to head up to meet my mom and Liza (my sister) at the Museum of Natural History. Unfortunately the rest of New York City and their kids had the same idea and buying tickets proved to be more stressful than worth the dinosaurs, so we headed over to Blossom for an uh-mazing lunch. I intended this post to really be about Blossom because I love it and all of it's sister restaurants. We love love Blossom and everything of the menu and are always torn what to order, but here's what I'll say: ORDER THE SOUTHERN SEITAN SANDWICH;). After that we moseyed over to Capezio to snag Avi some new ballet and tap shoes which my mom bought for her along with a leotard and some tights (mom and Liza had a bit of a ball with all the trying on and tutus). Then we hit up a kids store for some footie pj's for Avi as it's been frigid here in Brooklyn then headed home for a nap. While I cooked dinner the photographer from the times came by and snapped a few of us in our natural habitat. His name was Robert Caplin and he was a supernice guy. Chatted us up about his adventures and we were all ears. I made him have some dinner with us and sent some home with him for his wife (I can't help myself). Then bath time and bed and a serious night's sleep after a full day! Last week my Aunt Bonnie gave me an article she clipped from Newsday that I thought was worth sharing. A couple weeks ago, Nia Froome, a senior at Poly Prep (a school here in Park Slope), won a $10,000 prize and a trip to the White House through an OppenheimerFunds/NFTE/National Youth Entrepreneurship Challenge. A couple summers ago, Nia attended a four week business camp which got her wheels turning to start an online vegan bakery. Nia's parents became vegan over a decade ago after her mother was diagnosed with breast cancer. They were looking for a healthier diet and Nia wound up looking for a way to help her parents enjoy delicious treats made without any animal products. Apparently they're something to be reckoned with (I think I'll have to order some of those cinnamon rolls for myself...as I mentioned here, I have a weakness and some chocolate chip cookies for Richie). Nia's business has been striving AND she's tackling college prep and AP classes. I'm not sure how she does it, but I'm certainly impressed! You can check out her site and order whatever floats your vegan boat at: www.mammaniavb.squarespace.com. Last week, with the holiday pending, and an offer in to my mother-in-law to bring some soup and stuff for the family dinner, I remembered that I no longer had a local source for vegan challah (a staple at the Jewish family dinner table). Realizing that is was less than a week away from the holiday, I frantically started calling around. Luckily, not too far into my search, I came across an article that mentioned a vegan bakery in Williamsburg that made vegan croissant!!! (Uh, yes: the one thing I've been dying for and can in no way properly recreate since I've gone vegan). 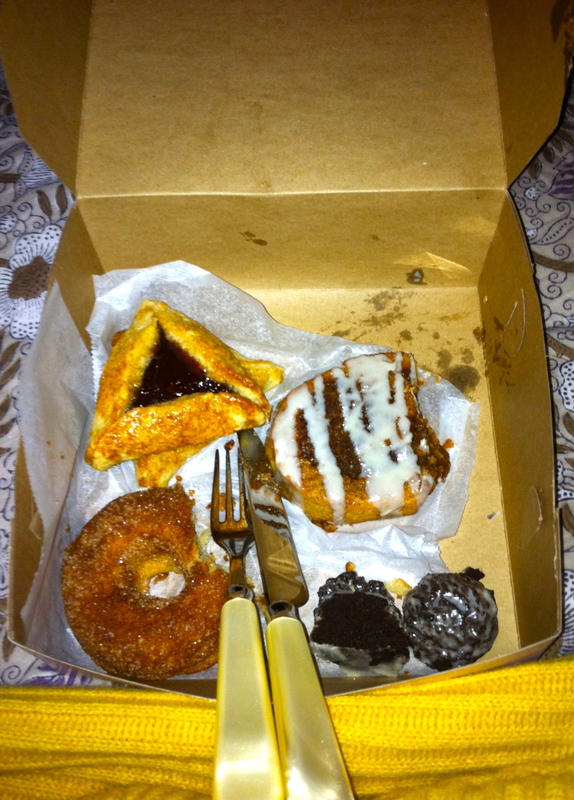 It's called Champs Vegan Bakery. I gave them a shout and spoke to Brad who was supernice and totally up for the challenge! Though it was his first try he made us four amazing and huge challahs. Everyone at the table said it was even better than the traditional one! I also went a little crazy when I picked them up and bought an apple pie and a blueberry pie and a box full of cookies that Brad so generously topped off for us. Everything was Uh-mazing! The apple pie was the best I've had in as long as I can remember. Writing about it is literally making my mouth water. Ok, cravings aside, it was all so beautiful and delicious, certainly worth a trip over there this weekend to get your sweet on! Yesterday morning we got up early and Richie decided he wanted to go out to eat. We were at my in-laws' house out in long island, so didn't have our neighborhood spots to rely on. 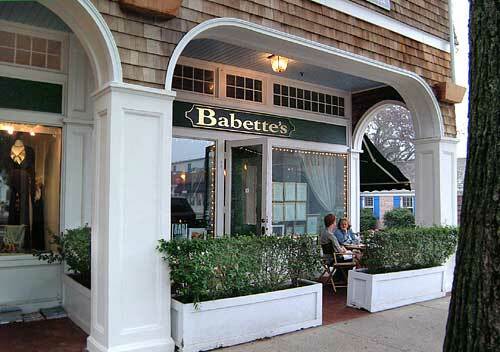 We usually eat in while we're out there, but once in a while, for a special breakfast, we head over to Babette's. We had the best weekend staying around Brooklyn. This summer has been so hot in New York that we've been running out of the city every weekend to avoid the heat and find some swimming opportunities. We decided to hang around this weekend and enjoy some time at home, visit friends, and take advantage of supercool Brooklyn. On Saturday night we left Avi home with our sitter and headed out for a night on the town with some friends. We decided to explore Williamsburg as we've been hearing more and more about all the great spots over there and haven't really ventured over there much yet. We wound up eating at a superyum Mexican restaurant called Mesa Coyoacan. While it was far from vegan, we feasted on a meal of fresh guacamole with homemade tortilla chips, mushroom tacos with cactus salad, platanos (our fave), and grilled corn w chile. Everything was scrumptious and I fully intend to go back soon!